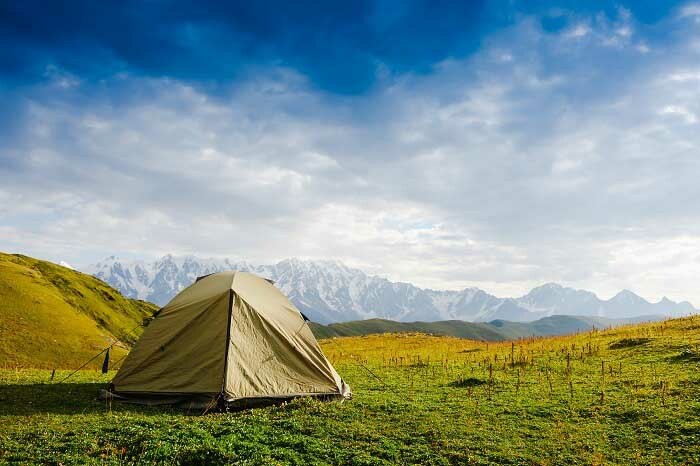 Are you ready to set up your tent and enjoy the marvelous sights across the state? 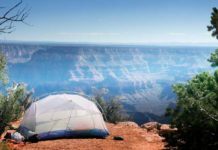 Let’s unlock the outdoors with the 6 best campgrounds in Georgia! It’s an ideal spot for those who love adventures and appealing settings in nature. So just leave your car or motorcycle behind and look no further than our six gems tucked away under the stars at night! Do you love lying under the beautiful sky at night, which is so great to be away from all the pollution and city chaos? The come here, at Hatch Camp and Art Farm for your best weekend ever! The site appears crowded a little bit than normal around this time, but it’s still an ideal spot to hide in the woods and enjoy your fishing in nature. First of all, it’s perfect for hanging out for the eclipse and dancing to the live folk music on the stage. The whole land can transform into the fishing ground if you like, especially when the surroundings seem serene and nestled beside the stream. Feel free to bring along your hammock to make your camping experience more fun, and kids will love that! If you’re one of those visitors who want to spend overnight here, then High Falls State Park is just perfect for that! 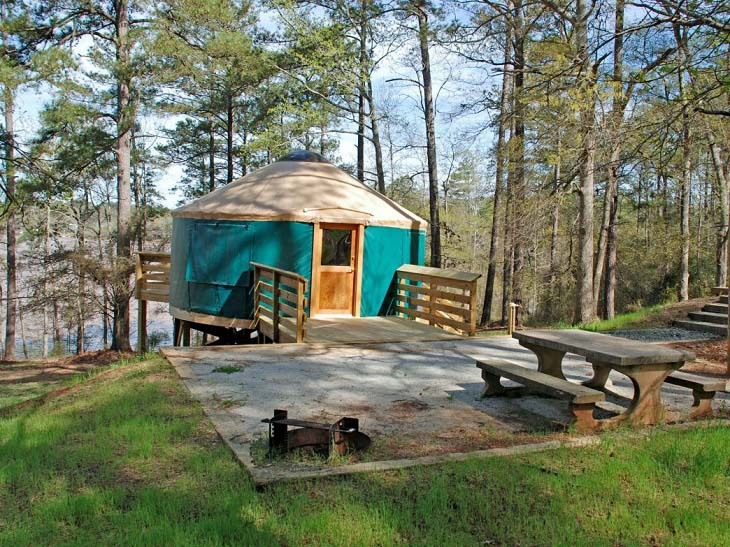 As one of the best campgrounds in Georgia, the Park offers us a cool-looking lakeside yurt, which shows up like a wood tent. Inside it, you can see one little deck, one picnic table, and a grill just outside, not to mention some useful furniture, such as a fan and a few outlets for electrical devices. Today, the place becomes a popular campsite and a comfortable side trip for every traveler without a doubt. Once getting here, don’t forget to take your camping cooler with you if you want to have some great barbeques with the family! Known as one of the oldest but most favored parks in Georgia, Vogel is perfectly popular in the fall as the mountains turn into the gorgeous blanket of yellow, red, and gold leaves. Besides, the place has a lake open to any boat, and when the summer comes, the visitors feel free to cool off their bodies at the beach - an awesome activity for a hot retreat with your k﻿﻿id﻿﻿s! Also, don’t rush to take out your sleeping bag to relax under the stars, but enjoy playing with your kids at the bottom of the upper and lower falls. If not, how about swimming endlessly at the Trahlyta lake, or hiking around it for a lot of fun. Well, the park is just pretty, the facilities are in good condition, and the staff here is amazingly helpful as well as polite. Trust me, this is one of the best campgrounds in Georgia, where you and family can join together in different activities, such as trekking, biking, swimming, mini golf, etc. Georgia’s biggest state park here is nowhere else than the F.D Roosevelt State Park. Know what? People would like to call it the haven for backpackers and hikers. This is a great chance for you to wind through both pines and hardwood or across the little waterfalls. Well, camping is a good thing but slightly less if you wake up with a stiff and painful back when having to sleep amongst the rocks and trees. Invest a camping cot for your better sleep at night. Sitting nearby the edge of the fishing lake, this camping spot is also a good site for horseback rides. So enjoy an active day of relaxation and fun here, where can accommodate any family as big groups. Besides, the visitors can try hands in various other activities, from basketball, volleyballs to softball. 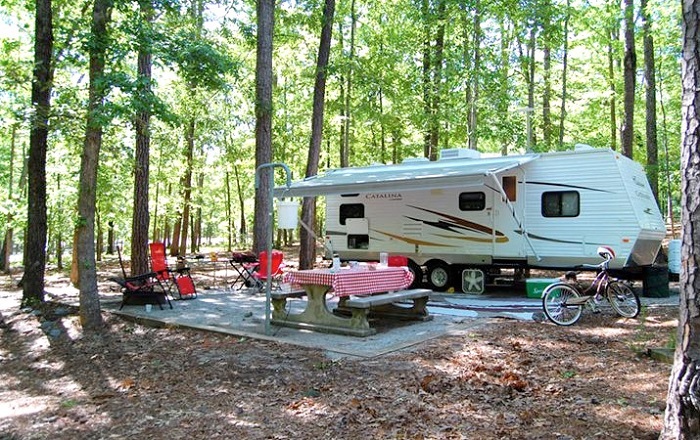 Another good option for you and the kids to have fun together is Jellystone Park, which is worth-to-visit one amongst many best campgrounds in Georgia. The park has everything a child craves for: several exotic playgrounds, spacious swimming pools, one game room, cool train rides, and more. Aside from those, the campgrounds feature the beautiful campsites tucked in the breathtaking settings. Each of them owns one fire ring so that the campers can circle the campfire and share the scariest ghost stories with each other. It also comes up with one table for the picnic where you can sit comfortably to eat. 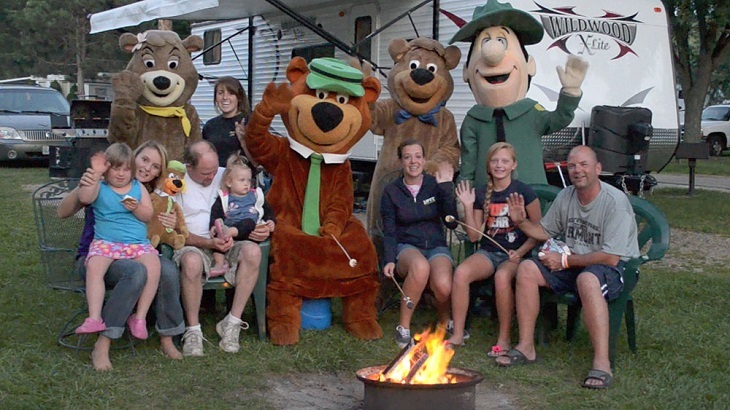 You must come and see why the park has always been the site for family camping since it owns almost everything that you and your family need for an unforgettable camping experience. Have you ever thought of huddling in your double sleeping bag with your partner? Don’t miss one of the best campgrounds in Georgia for couples - Amicalola Falls Park! This is a place where everyone can spell love, from sleeping under the beautiful stars to counting how many fireflies are there at night! Such a romantic camping experience won’t ever be found in any hotel or inn in the state, especially when you two can’t serenade by the crickets’ symphony. Much cooler than this, the entire spectacular scenery and trails from the park to the mountain just make the park one of the most popular places amongst other campsites. If you feel hungry, find a way to the Maple restaurant where is famous for its brunch buffet on every Sunday. When you try to think of what kind of vacation to enjoy with your kids or your lover, then take ‘camping’ into consideration! This is one of the cheapest ways to travel and get away from the city’s hustle and bustle. 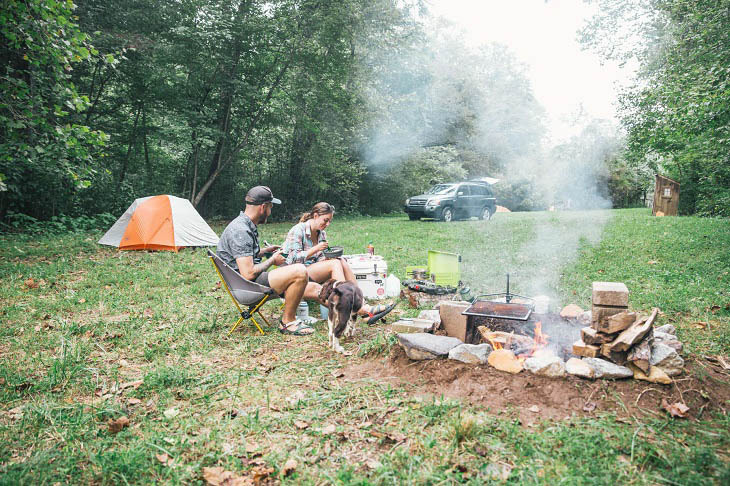 Our roundup of the best campgrounds in Georgia will amaze you immediately with the experiences that won’t seen in any luxurious hotel, inn, or resort you’ve been to. 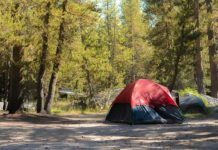 Next articleThe 5 Best Campground In Yosemite – Find Out Now!